Against the State: An Anarcho-Capitalist Manifesto diagnoses what is wrong with the American political system, and tells us in no uncertain terms what is required to stop leviathan. Rockwell's prescription is radical, calling for the wholesale realignment of society away from the state and toward voluntary order. As the book incontrovertibly shows, the overwhelming problems that confront us today are no accident. They stem from the nature of government itself. Only peaceful cooperation grounded in individuals, families, civil society, and markets can rescue us from our present plight. 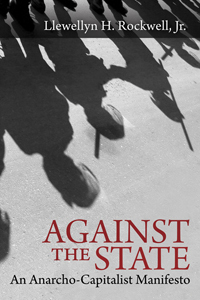 Against the State applies Murray Rothbard’s unique combination of individualist anarchism and Austrian economics to contemporary America. Fueled by an out-of-control banking system, the American Über-State has become in essence fascist. We cannot escape our predicament through limited government or traditional political means: government is incapable of controlling itself. Only a purely private social order can save us, and Rockwell succinctly sets out how an anarcho-capitalist society would work. In 190 short pages, Rockwell has created nothing less than the modern manifesto for today's anarcho-capitalist movement. This is the must-read book of 2014 for libertarians interested in real arguments for creating a peaceful, voluntary, free-market society. 6. Why Not Limited Government? 7. How Would Anarchy Work? “Fascism” has become a term of general derision and rebuke. It is tossed casually in the direction of anything a critic happens to dislike. Lew Rockwell's new manifesto is a clarion call—creative and thought-provoking on every page—for a principled liberty in our time. Lew Rockwell's manifesto is a clarion call—creative and thought-provoking on every page—for a principled liberty in our time. Political philosophy is dominated by a myth, the myth of the necessity of the state.